Creating a tradition destined to endure was the Christmas present that Major C.G.R. 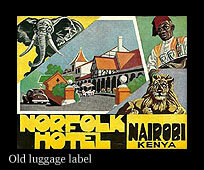 Ringer gave to Kenya and Nairobi (and just what they wanted) when he opened his little Norfolk Hotel in the year 1904. Then and now, the Norfolk has been totally and inescapably an integral part of the country's history. One could, without fear of correction, say that had there, in fact, been no Norfolk Hotel, there might never have been the capital. It was at the Norfolk that all new arrivals gathered, then men with the money, ambition and foresight to found a Colony, for Kenya as a country has only existed since the turn of the twentieth century. By this time, Kenya was one of the world's most promising hunting grounds for the Big Game Hunter, an entirely new resort from the winters of the northern hemisphere for the rich, the adventurous and those in search of a different life from the Old and New Worlds. But it was, nonetheless, a hard and Spartan life for new arrivals, no place, in spite of its warm and sunny climate during most of the year, for any but those in the sturdiest of health. It was a country of arid deserts, dense primeval forests, and mile upon mile of `bush country' where water of any kind was hard to find. It was a country of fever and few remedies. The medicine chest was carried by the travellers' porters as were any other refinements they thought they might require. And although porters were easy enough to find and employ for long cross-country safaris, their behaviour, for those unaccustomed to the African way of life, was hard to tolerate or understand. 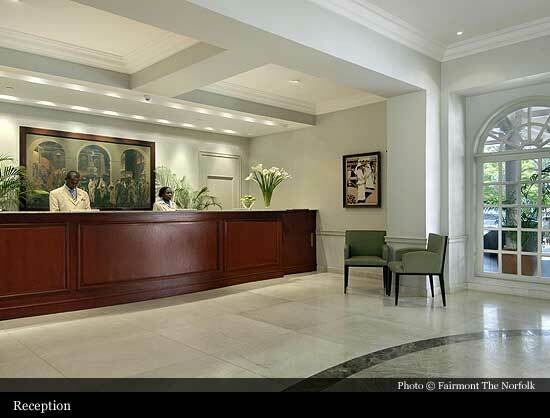 When the hotel was finished in 1904, and for many years afterwards, if people were asked their first impressions of Nairobi, they would invariably answer 'dust!'. The red dust of the plains enveloped everything. Passengers who arrived by train, disembarking at Nairobi Station, were covered in fine dust, red like the Masai country they had racketed through, for in spite of topees, boots and spine-pads, the dust inevitably penetrated everything. The Kenya Luxury hotel, with its cool resting rooms and hot and cold baths, was civilization in the bush. With nothing in front of it except the papyrus swamp with the frogs (and sometimes the lions) and nothing behind it but barren, open land, the white railings of the hotel's perimeter spelt civilization and comfort for those early arrivals. Rickshaws, privately owned or hired, decanted the Norfolk's patrons at the entrance. And 1909, so far as the Norfolk was concerned, was yet another epic year. It seemed as if almost each one was more glittering than the one that went before. Feted and eminent visitors to Nairobi and the Colony had been Mr. and Mrs. Neville Chamberlain (Secretary of State for the Colonies) in 1902; the Duke and Duchess of Connaught and the Princess Patricia in 1906; 1907 was the year of the Rt. Hon. Winston Churchill's visit, as Under Secretary of State for the Colonies. 1909 saw the arrival of Theodore Roosevelt, on his retirement as 26th President of the United States of America after 25 years of service. And so the Norfolk saw them come and go - adventurous, eccentric, as remarkable a clientele as any hotel could boast. The Norfolk Hotel was central during the First World War as a meeting place for both the Military and civilians. Kenya became a Crown Colony in 1920. The 1921 census showed that by now there were 9,651 Europeans in Kenya, of whom 1,300 were landholders. 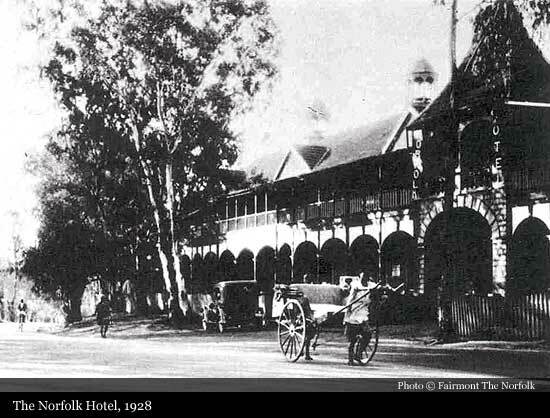 In March 1922 in front of the verandah of the Norfolk Hotel, where guests enjoyed their midday drinks, was staged the tragic political 'Harry Thuku incident' when an outraged and undisciplined mob of some six or seven thousand people demonstrating in the imprisoned Harry Thuku's favour stormed down upon the police lines adjacent to the Hotel. Twenty-one Africans, including a few women and a teenage boy were killed. The road past the Norfolk was re-named Harry Thuku Road some years after Independence to commemorate this event. In 1923, this luxury hotel in Kenya was purchased by Mr. W. H. E. Edgley. 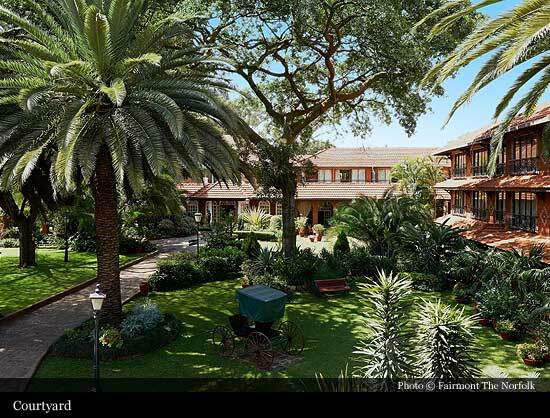 He had previously managed it for about ten years, together with the Hotel Metropole at Mombasa and the Victoria Hotel at Entebbe, for the then owners East Africa and Uganda Corporation Ltd. In the period 1927 / 1930 the Norfolk again changed hands. These were the years of the great depression in Kenya when, for want of finding ready money elsewhere, many of the more optimistically inclined joined the Kakamega Gold Rush (1933) in the vain hope of finding gold, and thus, and Instant Fortune. The whole country fell into dire financial difficulties in these years, and the hotels from north to south, east to west, the best along with the worst, were up for sale at giveaway prices. To one person above all others, the Norfolk proposition was attractive, and was worth something better than a song. In fact, to the gambler in him, it was probably irresistible. Abraham Block, who arrived from South Africa in 1903 when the lands of the Great Rift Valley from Naivasha to the Mau Escarpment were proposed as the projected colony in Africa for Jewish settlement, found when he reached here that Kenya was not to be Canaan after all. With very little money he befriended Lord Delamere, became a farmer and a cattle transporter, and over the years was involved in every sort of activity, usually profitably. 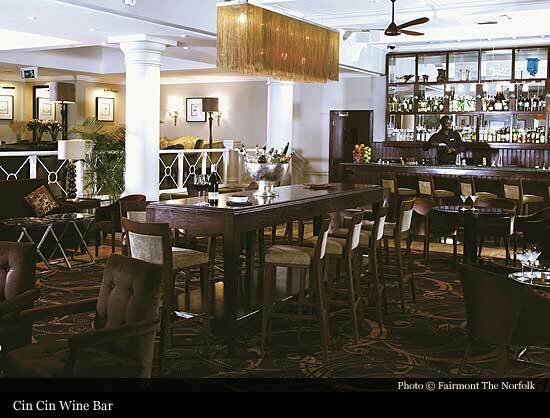 In 1927 Abraham Block exchanged a plot of land on what was then Delamere Avenue (now Kenyatta Avenue) for the Norfolk Hotel, gave up his butchery and with the Norfolk Hotel as his baseline, founded the Block Hotels dynasty. The Second World War brought money pouring in. British Government support to local military expenditure was lavish, and the farmers who had not been enjoying the days of plenty in the slump years (rain failure, locusts and the general hazards of the 'new' colony) now found that there was a ready market for almost everything that they could grow, especially things edible. Once again, the Norfolk found itself the venue of fighting men and women from the four corners of the Earth. For the first 10 years of Block ownership, all profits of the Norfolk were ploughed back to make it the beautiful, comfort establishment it had never been in its rollicking, roistering earlier days; yet with improvement, little of its essential character altered. In October 1970, one of the oldest bedroom wings of the Norfolk was demolished to make way for the double-storey luxury wing, which completed the quadrangle of the private enclosed garden behind the hotel. The new wing, completed in 1972 gave the Norfolk a total of 170 rooms or 280 beds in all. At the same time that the new wing was constructed, the old block of 30 single bedrooms was entirely modernized and refurbished. In 1973 another 'museum piece' was added to the Norfolk's collection, to complement the ox-wagon in the garden and the rickshaw, an exhibition `transport trio' of hand-drawn, animal-drawn and machine propelled transport, as used in Kenya since the turn of the century. This was an A-model Ford Roadster, a 24-3 hp model, year of manufacture 1928 with registration number B9414. In good going shape, this vintage jalopy is still in the central courtyard today. In 1977, forty years after it was first built in 1937, the two-storeyed `1937 block' was completely gutted and modernized, preserving its familiar exterior. As 1980 drew to its close, it seemed as if the Norfolk had everything going for it. Amongst the clients taking up accommodation at the hotel just before Christmas was an individual who was to change the course of the Norfolk's history. On 23rd December, traveling under the name of Muradi Aksali with a Maltese passport, he was allocated Room 205 near the car park. 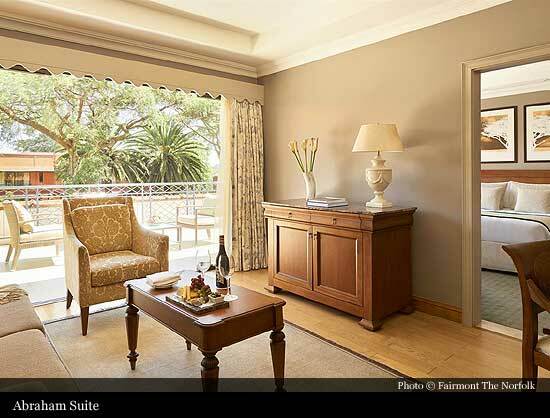 This room he was to reject, insisting on being transferred to one of the new bedrooms over the Eland Room dining room at the front of the western wing. The awful significance of this simple request was not apparent until it was all too late. It was later established that this gentleman had also tried to reserve accommodation at both the Manor Hotel and Nyali Beach Hotel, both at Mombasa. This guest kept to his room at all times including for meals, and refused any housekeeping in the room throughout his stay. At just about midday on 31st December, Muradi Aksali ran down the wide carpeted staircase from his room on the first floor of the western wing, walked out past the reception counter and was never seen again. At 8.30 p.m., with a blinding flash and a roar that split the night, the Norfolk exploded. Pedestrians were hurled to hard pavements, cars on the Uhuru Highway were flung into the air, debris tossed metres high rained steadily all round. The explosion was heard thirty miles away. The ensuing fire gutted the front of the hotel, the whole of the western wing disappeared. It was fortunate that the bomb did not go off any later, as the New Year's Eve celebrations would have been in full swing and much more would have been lost, in terms of human life. The terrorist, identified later by the police and Interpol as Quddura Mohammad Abd-el-Hamid, had boarded the 2.30 p.m. Kenya Airways flight bound for Jeddah via Khartoum six hours before the bomb exploded. 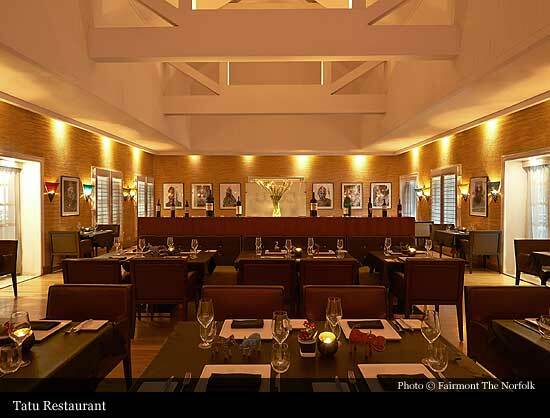 On January 3rd, the Norfolk took stock and it was established that it had lost the Eland Room and its kitchen, two function rooms and the coffee lounge. There was however still 75% of the hotel able to continue functioning. The renovation work started immediately. 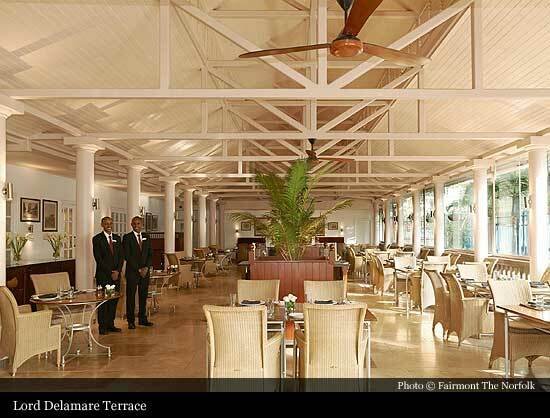 Very early in 1981, part of the historic Lord Delamere Terrace was roofed over. By Christmas 1981 the Norfolk's western wing had risen to first floor level, and the roof had already been tiled. The works were completed in the latter part of 1982, and these comprised a new restaurant (The Ibis Grill), a ballroom, two function rooms (Tinga Tinga and Pioneer), a new kitchen and service accommodation and stores, and 26 double bedrooms on the first floor on either side of an attractive roof garden. In 1986 the singles wing was completely renovated (now Kijabe Wing), ready for occupation by 1987. During 1989 the Norfolk Hotel became part of the then-empire of Tiny Rowland, Signet Hotels, which would later become Lonrho Hotels Kenya. The 1998/99 renovation, brought the hotel's total guest rooms and suites to 167, with possibility of accommodating 266 guests. The Reception, Ibis Restaurant and Pioneer Room were renovated, a new Business Center and Gift shop were created and the new Tinga Tinga Room and Acacia Wing were built. In 2004, the Norfolk Hotel celebrated its 100th birthday with further extensive refurbishments of public areas and rooms; with seasonal renovation exercises being carried out to date. 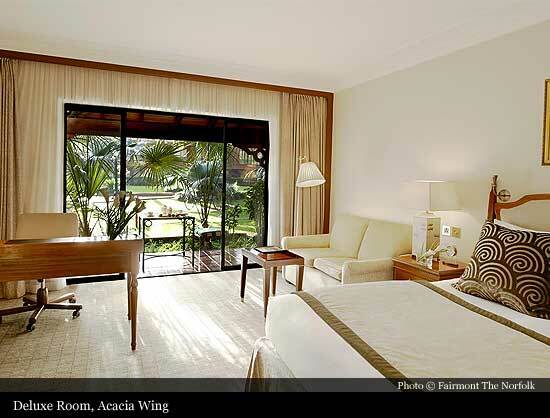 It was acquired by Kingdom the same year and is now managed by Fairmont Hotels & Resorts. 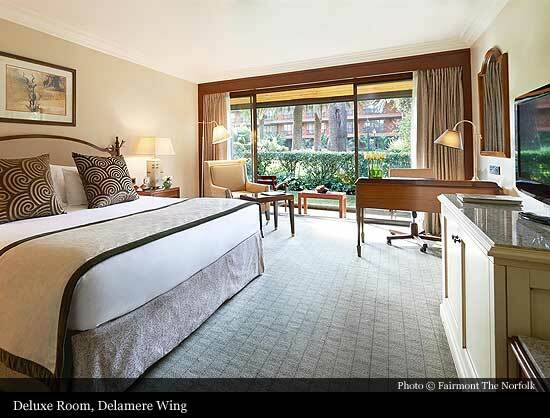 Fairmont has a long tradition of stewardship with irreplaceable hotels. 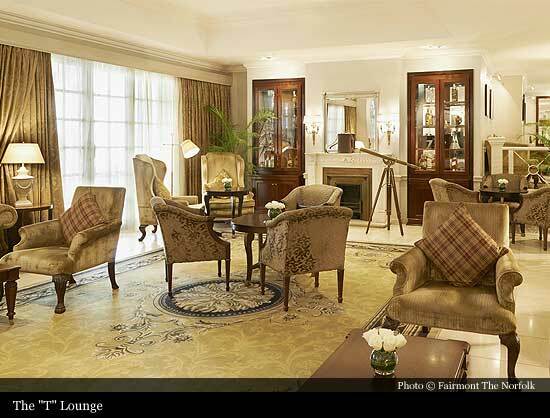 The Savoy in London, The Fairmont Hamilton Princess, The Fairmont San Francisco The Fairmont Banff Springs and Fairmont Le Chateau Frontenac are just a few of the historic hotels that the collection includes. 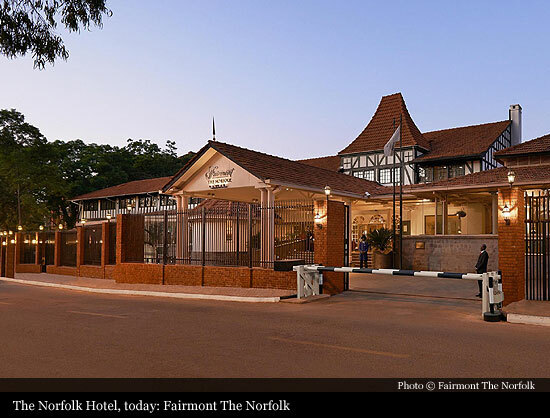 Fairmont looks forward to seeing the Norfolk through the next century.